The term “Lazy Susan” was first coined in a Vanity Fair advertisement back in 1917. Before that point, these devices were often referred to as “dumb waiters”. No one knows exactly why these revolving serving trays got their peculiar name, but some claim they were invented by Thomas Jefferson whose daughter, Susan, always complained about being served last during family meals. Now-a-days, lazy susans have many uses in the kitchen, one of the most popular being in corner cabinets where they can help maximize access to stored items. Below, you’ll find valuable information on the various types and materials of lazy susans. And if you’re looking to order lazy susan parts or products, be sure to check out our entire lazy susan hardware selection! Kidney Shaped – Kidney shaped lazy susans, such as the Rev-A-Shelf Premiere Wood Kidney Susan Shelf, have a soft, rounded, triangular cut out. These kinds of susans are often the most popular as they’re designed for the 90 degree corners found in most kitchen cabinets. Their 32 inch diameter proves advantageous because it’s usually the largest susan that will fit into a standard, 24 inch-deep, base cabinet corner. However, smaller kidney-shaped susans are also available; such as the 18 inch diameter susans that fit in a standard 12 inch-deep, upper corner kitchen cabinet. Full Round – Full round lazy susans are rotating, circular shelves that work well with standard-sized, base kitchen cabinets that have a diagonal corner rather than 90 degree ones. However, there are smaller sizes available that are designed for both 90 degree and diagonal corners in upper corner cabinets. For one of the top selling, full round susans, check out theRev-A-Shelf Banded Wood Full Round Susan Set. D-Shaped – D-Shaped susans, such as the Rev-A-Shelf Premiere D-Shaped Wood Susan, are very similar to the full-round susans, except they have one flat side rather than being completely round. These susans are designed for wall cabinets, usually above refrigerators and pantries, because the flat side allows a pantry door to close flush over the susan. 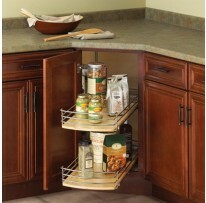 Often, you will see d-shaped susans that have 3 to 5 rotating shelves such as the Rev-A-Shelf D-Shaped 3 Shelf Set. Pie Cut – Pie cut susans typically have the cabinet doors attached directly to the susan unit. Although these units are already put together, they tend to be more difficult to install because their tolerances can be difficult to maintain. In addition, the largest pie cut susan usually has a 28” diameter which doesn’t always maximize space usage. In addition to the various styles of lazy susans, you also have three different material types of susans you can choose from. These include wood, polymer and wire. Wood – Wooden lazy susans have been growing in popularity because of their rich, textural look and their uncanny ability to match the wood interiors of cabinets. Most wood susans are constructed of birch or maple plywood, or are built from pieces of solid wood glued together so as to reduce the chance of warping. After the pieces are put together, the shelf edges are then wrapped with matching plywood or a solid wood lip, about 1 inch tall. This keeps items from falling off while rotating on the shelf. Polymer – Molded polymer or plastic is the most common type of lazy susan material. Polymer susans are usually designed with ribbing for strength as well as textured surface that provides a non-skid effect. These shelves are economical, durable and washable and they are usually available in both white and almond colors. Wire – Wire lazy susans hold their roots in European design and are constructed from heavy gauge, welded metal. Once assembled, the wire is plated in metal or covered with an epoxy-coated paint for a clean, contemporary look. This makes these kinds of susan perfect for kitchens with a more modern design.